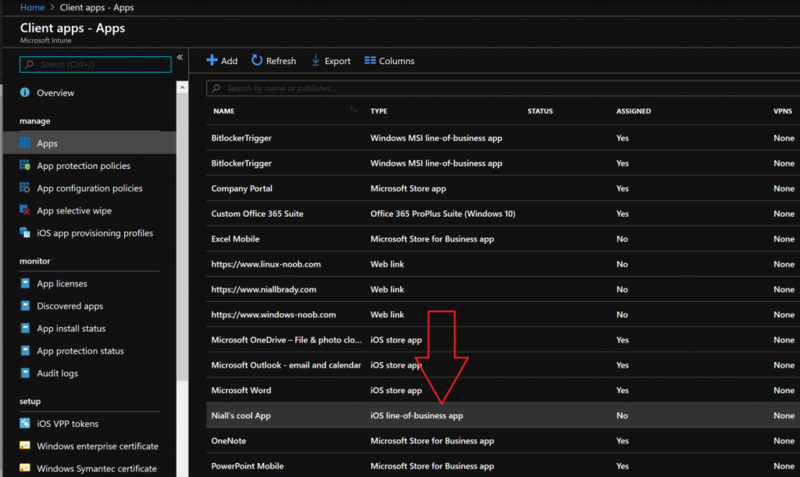 Learn how to leverage Intune support for Microsoft Graph and PowerShell to enable powerful automation and IT security- my notes | just another windows noob ? Microsoft Ignite 2018 (in Florida) has just come and gone but there’s still 644GB of sessions to get through, and all of them are online and available for you to review (or download). Ignite is an awesome experience but not everyone can attend, even if you could attend there’s no way you could see all the sessions you wanted to see, however now you can. 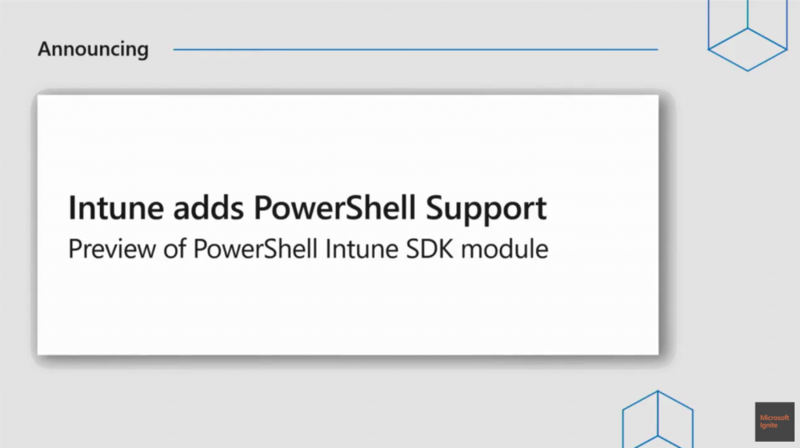 In this blog post I’m going to add my notes about a session called “Learn how to leverage Intune support for Microsoft Graph and PowerShell to enable powerful automation and IT security” by these two clever guys. I do this because it’s great blogging and learning material and because it means that I can dissect these sessions in fine detail to see exactly what they were talking about and to expand upon it including code samples and links which you don’t get by simply clicking on a video. 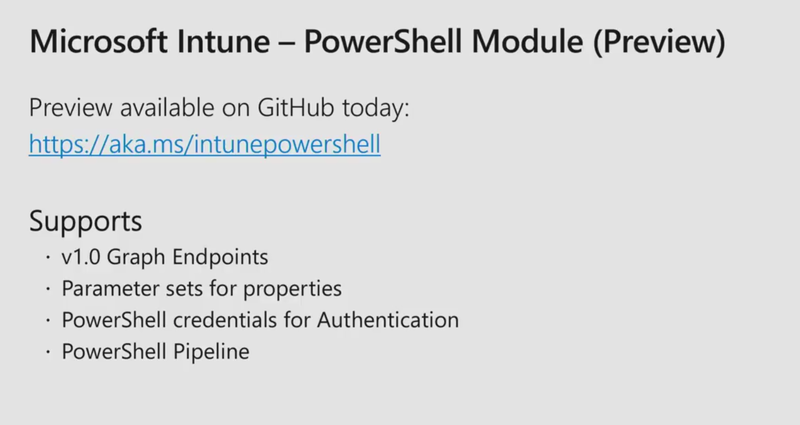 The session starts with a quick intro from David and Rohit before acknowledging that Rohit wrote the PowerShell modules for Intune. Good job Rohit ! (p.s. he’s also good at Music and is on soundcloud). 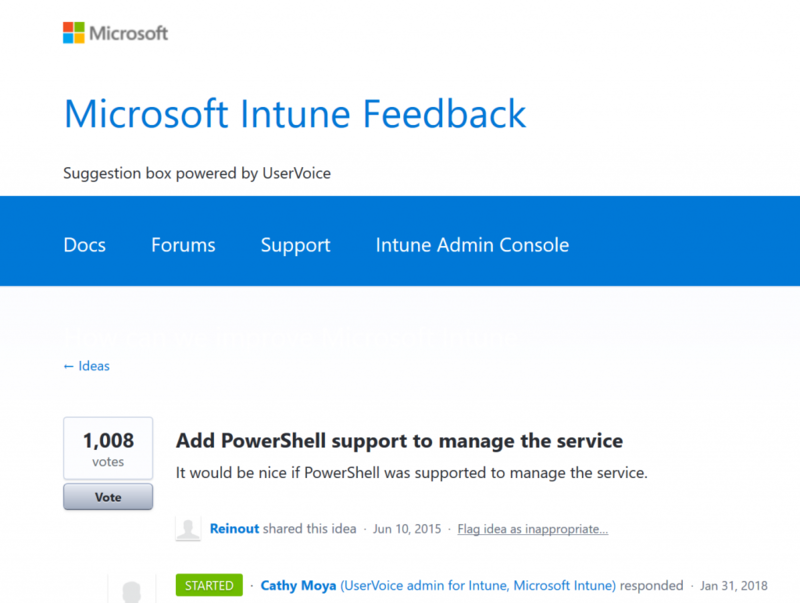 Next, David points out that Intune totally rebuilt itself in 2017 when they decided to use Microsoft Graph API as the API of choice for use with the UI and to use Automation and Services to interact with Intune. Microsoft released GitHub PowerShell samples in 2017 (which I blogged about here). 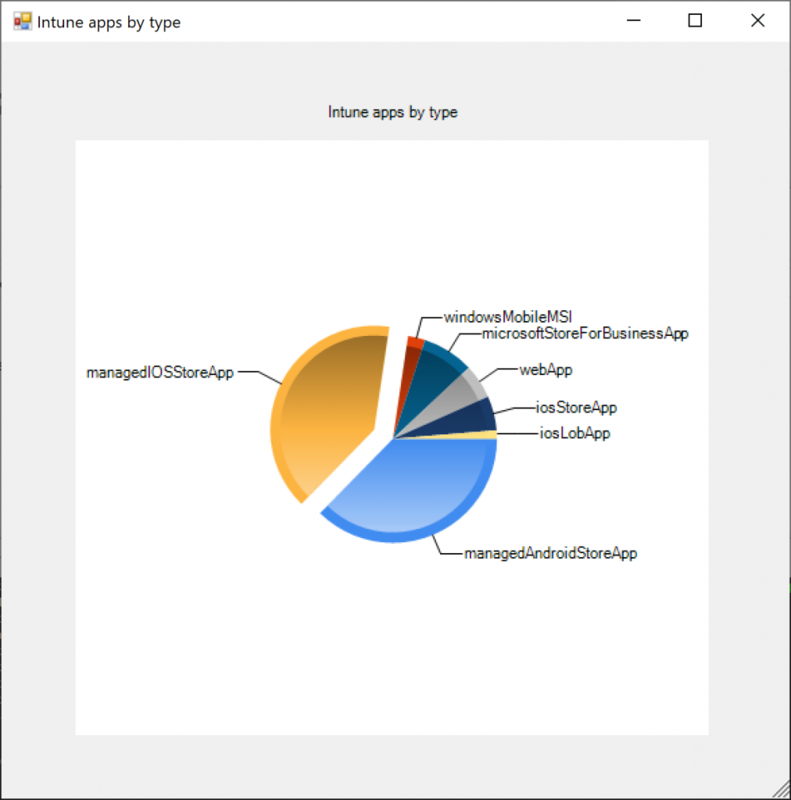 These PowerShell samples are constantly evolving and continuously being developed and allow you to manage Intune using PowerShell. These samples are also being created due to UserVoice items, for example this one. 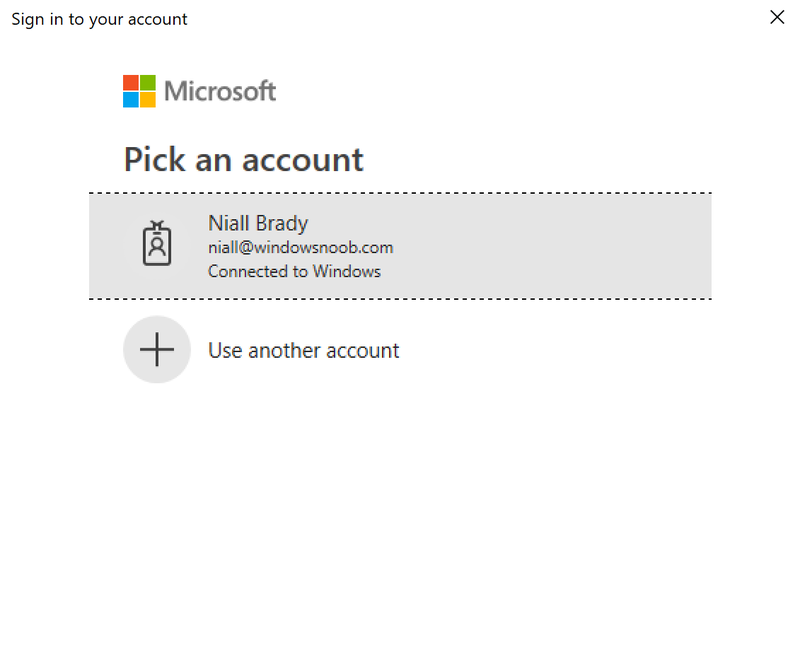 The granular level of control with Microsoft Graph, also comes with complexity so Microsoft have also provided a user interface by way of the Azure Portal. The user interface (UI) abstracts away some of that complexity and makes it easier to get things done. The Intune PowerShell SDK has a 1:1 mapping between Graph and the SDK so whatever you can do in Graph, you can also do in the SDK but this comes with the same complexities that come in the Graph API, so to assist with that they will release modules (Scenario Modules). Rohit demos some of this in the session (and they want feedback on this, so if you have any suggestion or feedback, please provide it either to them directly or send it to me and i’ll pass it on). 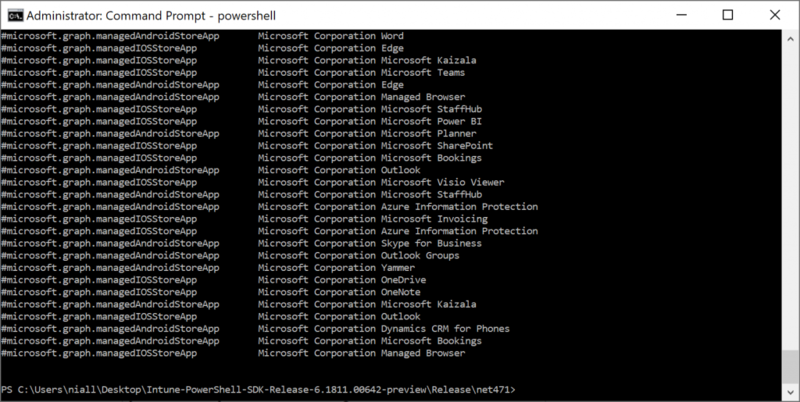 To begin with, browse to https://aka.ms/intunepowershell and scroll down to learn how to login, use the commands and so on. To get the modules, scroll up to the top and click on the Releases tab (in GitHub). 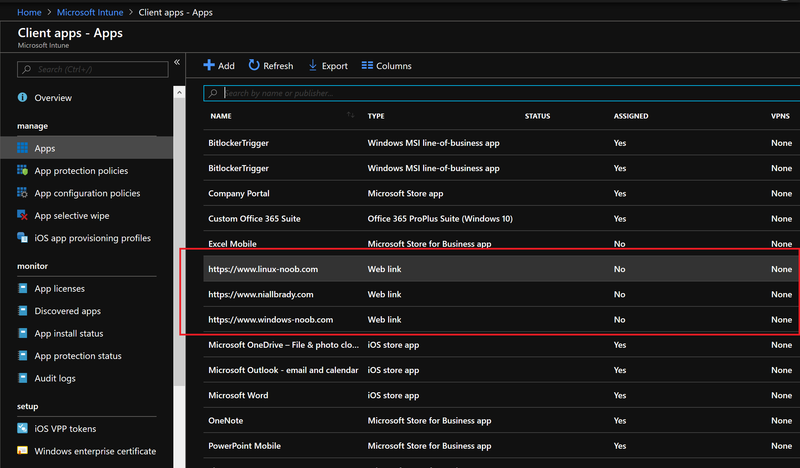 In the releases, click on the link the ZIP file, download it and extract it, there are two folders, one for cross-platform (netstandard2.0) and the other for Windows only (to popup forms etc). In the net471 folder you’ve a bunch of files and the psd1 file is the most important, it’s the module manifest (it actually does stuff) and that’s the one you need to import to do things. 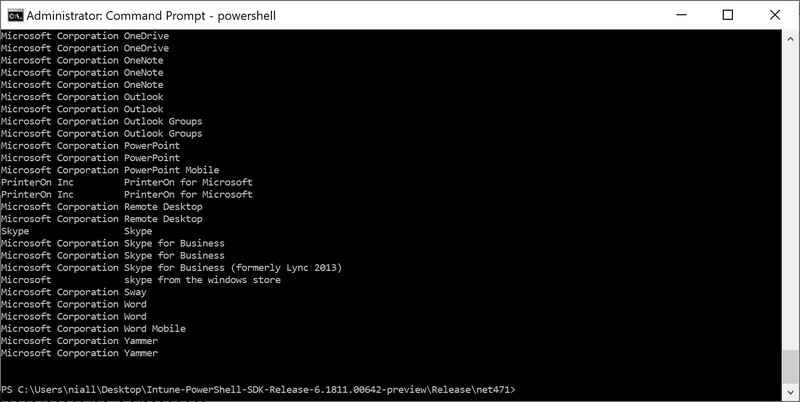 To import this module you need to first open a PowerShell (or cmd prompt) using Administrative permissions. Next, browse to the folder where you extracted the Microsoft.Graph.Intune.psd1 file and then issue the following command in an administrative PowerShell cmd prompt. 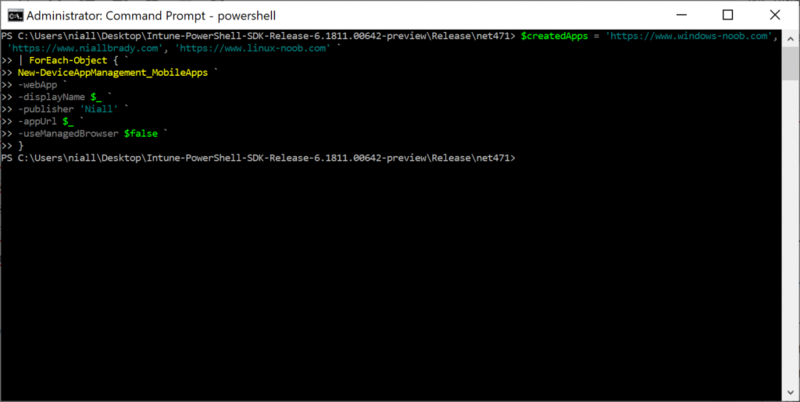 to resolve this, you need to unblock the files, you can use the following PowerShell to do so, use the following command while you are in the folder containing the files you just downloaded. after which you can import the module without errors. Once done you are connected to your tenant. So each of these 1287 cmdlets equates to an operation in Microsoft Graph. Amazing. 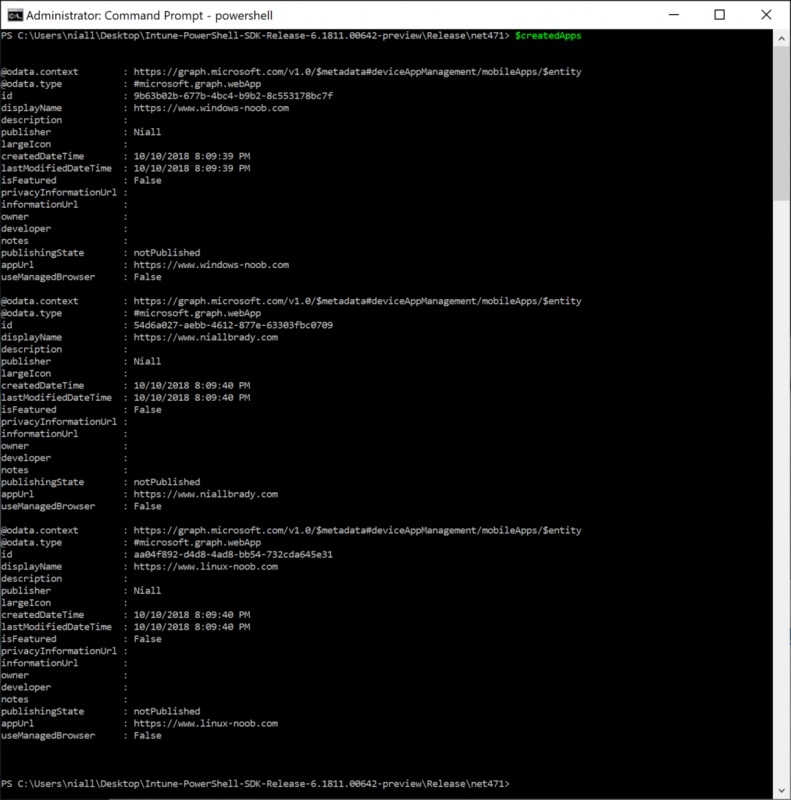 These cmdlets were generated using the Graph MetaData and these are based upon the Microsoft Graph documentation. Here is an example of that. To further filter, you could say filter where the publisher contains the word, Microsoft. Ok that’s cool, but to do really cool things try this code. and here’s the result of that..
After this point, Rohit demo’d auditing of paged events as only 1000 events can be paged via Graph at one time. This is shown below. 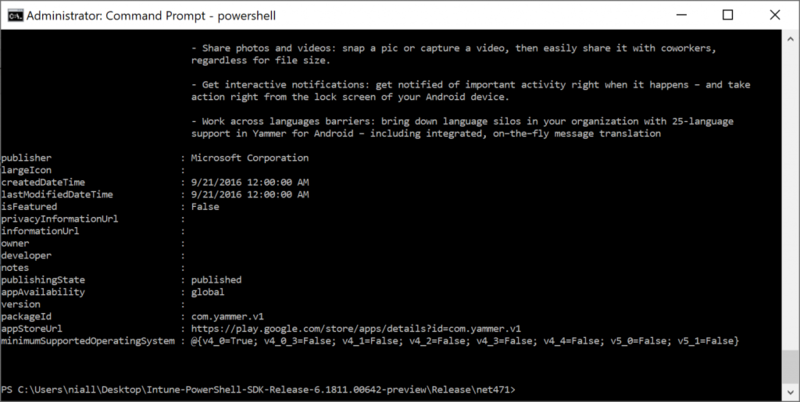 Note that this doesn’t work in production currently, only special Beta tenants. So I’ve nothing to show here.. check the video for more details. 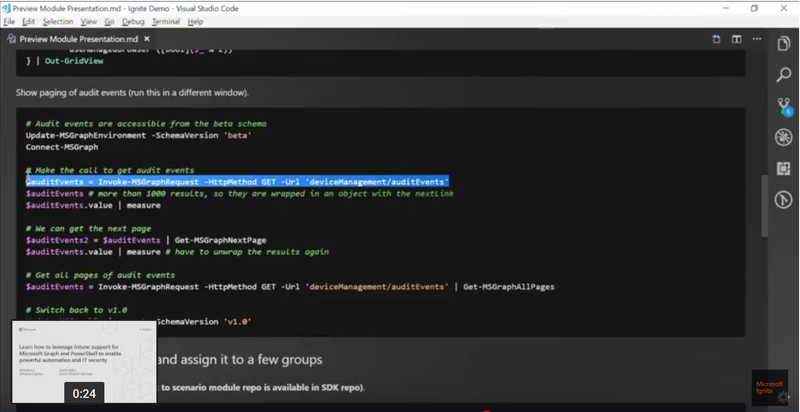 Now, go back to the Intune PowerShell SDK GitHub page here and scroll down to the scenarios link..you get a link to this page – https://github.com/Microsoft/Intune-PowerShell-Management which contains links to more samples and modules. Next let’s try and get all apps and then group those apps by app type. and then you can visualize the data using another of the scenario module scripts (which is in the Samples sub folder, see my screenshot below the code) which uses WinForms. Pretty awesome stuff, well done Rohit and David ! 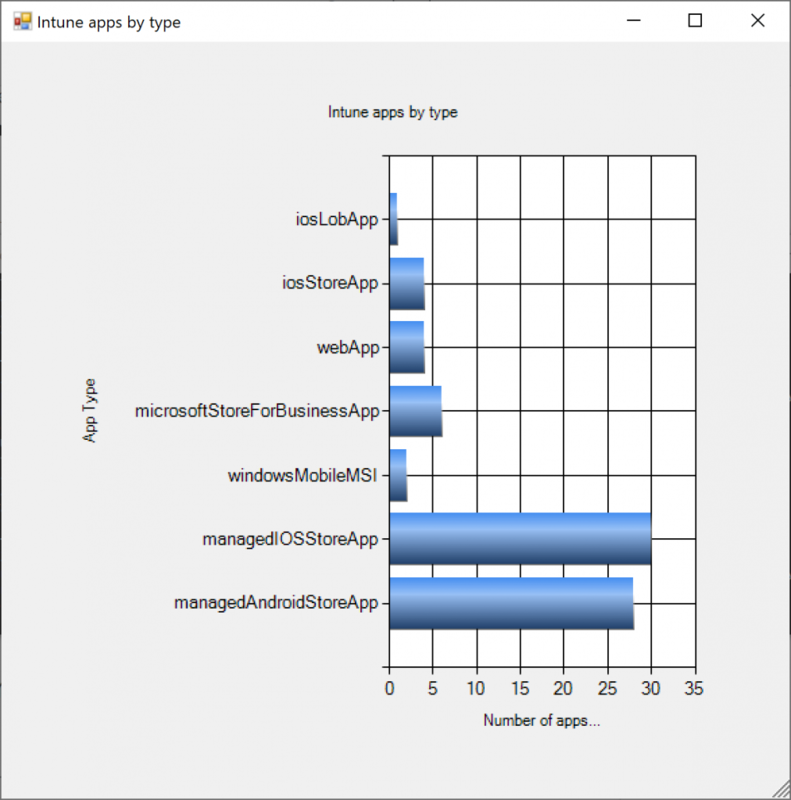 This entry was posted in 2018, Azure, Graph, Intune, iOS. Bookmark the permalink.